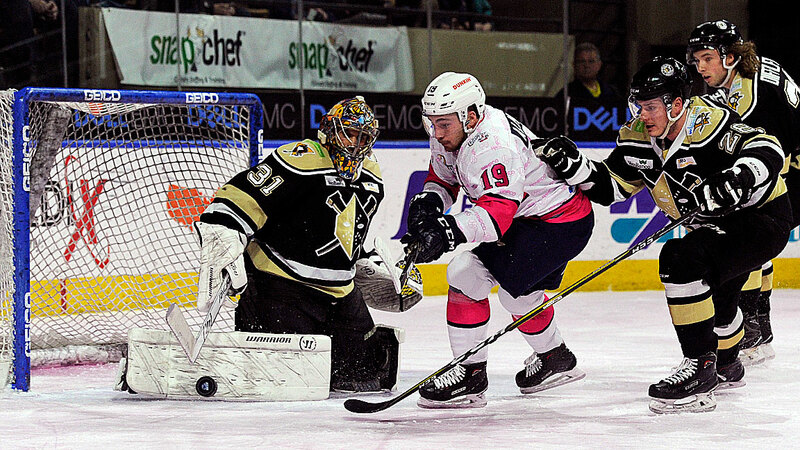 Worcester, MA – The Worcester Railers HC (21-20-3-3, 48pts)dropped a 5-1 decision on PINK in the RINK Night to the visiting Wheeling Nailers(21-21-5-1, 48pts) in front of 6,721 fans at the DCU Center on Saturday evening. The Railers close out the 3-in-3 home weekend on TRAX’s birthday with a 3pm start vs. the Cincinnati Cyclones at 3pm. Tyler Barnes extended his franchise record goal scoring goal streak to six games and his point streak to eight (8-2-10) with a third period power play goal while Mitch Gillam made 17 saves in net in the home loss. Jordan Ruby made 33 saves in net in the win for the Wheeling to break their seven-game losing skid (0-3-3-1) as Worcester dropped to 13-8-3-1 on home ice this season. Worcester was outshot 11-4 in the first period and trailed 1-0 through 20 minutes of play. Yanick Turcotte (7thFM) tried to get the crowd going early as he dropped the mitts and helmet with Jake Schultz at 5:41 for a quick scrap. Wheeling would net the only score at 17:24 with their ECHL leading 14thshorthanded goal after a turnover in front of the Worcester net and a quick shot by Michael Phillips (13th) past the blocker of Mitch Gillam. Neither team found the back of the net in the second period as the Railers outshot Wheeling 15-1 in the middle frame and Ryan Hitchcock hit the crossbar. Tyler Barnes put the puck into the back of the net on the powerplay midway through the period, but it was ruled he deflected the puck with a high stick. Worcester trailed 1-0 through 40 minutes of play despite outshooting Wheeling 19-12. Tyler Barnes (19th) would tie the score 1-1 at 1:54 of the third period as he deflected the puck off his skate into the net on the power play assisted by Barry Almeida and Nick Sorkin. But the excitement would be short lived as Wheeling would score the next four goals to pull away with the 5-1 road win as Cedric Lacroix (13th) scored at 2:45, Yushiroh Hirano (14th) at 9:57, Michael Phillips (14th) again at 11:23 and Alec Butcher (5th) on the power play at 14:15 to put the game away. Shots int the third period were 15-10 in favor of Worcester. Notes: Three Stars: 3rd star: Alec Butcher (Goal) 2nd star: Jordan Ruby (33 saves, Win) 1st star: Michael Phillips (2 goals, assist) …. final shots were 34-22 in favor of Worcester…. Jordan ruby (5-2-2) made 33 saves on 34 shots for Wheeling…. Mitch Gillam (14-12-2) made 17 saves on 22 shots for Worcester while Evan Buitenhuis was the backup….Worcester went 1-for-5 on the power play while Wheeling went 1-for-3…. Kyle McKenzie (inj), Woody Hudson, Ivan Kosorenkov (inj), Alex Vanier (susp), and Malcolm Gould did not dress for Worcester…. Jeff Kubiak is on recall with the Bridgeport Sound Tigers… Tyler Barnes now has a franchise record eight-game point streak (8-3-11) and has set a Railers record with goals in six straight games……..the crowd of 6,721 was the second highest of the season at the DCU Center (opening night was 8,853). What’s on tap – SUNDAY FUNDAY!